Boss Keith Curle believes new signing Joe Powell has a ‘fantastic attitude’ and ‘hunger’, and that he will bring extra creativity to the Cobblers midfield. The 20-year-old West Ham United player has put pen to paper on a loan deal until the end of the season, and immediately got down to work with his new team-mates in training on Monday. Inexperienced he may be, with Powell having made just one substitute appearance for the Hammers first team as well as a clutch of Checkatrade Trophy games with their Under-23s, but Curle believes the player will add something to the Town team. “Joe is a talented creative midfield player,” said the Cobblers boss, who says the player chose Town despite having other options. “He likes to play in the opposition half of the field, he likes to get on the ball to open up defences and to create things. As with Town’s other recent loan signing, George Cox, Powell is a player that Curle says he has been keeping tabs on for a while now, and he is delighted he will finally get the chance to work with a player he rates so highly. “I have watched Joe develop over the last year or so, I have tried to sign him before but he wasn’t available,” said Curle, who left his role as Carlisle United boss last summer. 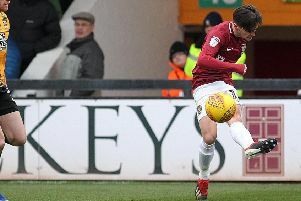 Powell will now be in contention to make his Cobblers and Football League debut in Saturday’s PTS Academy date with fellow strugglers Morecambe.